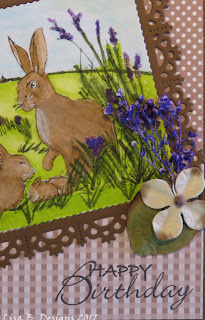 Using the scene from the Hobby Art March Hares Set, I stamped onto Watercolour Card and coloured using Watercolour Pencils. The scene was not quite as wide as my die, but that didn't matter, as I drew in some 'extra bits'! Can you spot my additions? Picking out the brown from my hares, I used some of the Anna Marie Designs Card and layered as a half and half arrangement. I did not need to cover the join in this case, as I knew that my scene was going to cover it all. Easy peasy, but I like it anyway! Next time I will check my stash before starting to colour though!